Halloween is this week -- time for a spooky undead-themed reflection. Let's mind-wipe ourselves of the movie that came out this year. Think that energy level drain is horrifying? You ain't read up on old-school mummies lately! The golden era for mummy mythology seems to be at the start of the 20th century, coincident with the golden age of Egyptology, especially after the tomb of Tutankhamen was opened in 1922. Within the next two years, a half-dozen members of the archaeology team (out of a group of about 60) had died from various weird causes, and this fueled the popular imagination that there was some "curse" from disturbing the tomb. In particular, Lord Carnavon, the financial backer of the effort, died about 4 months after from a confounding combination of mosquito bite/ shaving accident/ blood poisoning. Others died from fever, malaria, more blood poisoning, assassinations, and being shot by one's angry wife. Now, apparently real-life curse-inscription texts in Egyptian tombs are pretty rare; but at least one was found that actually reads, "Cursed be those who disturb the rest of a Pharaoh. They that shall break the seal of this tomb shall meet death by a disease that no doctor can diagnose." Read more at the Wikipdia article on Curse of the pharaohs. A decade later in 1932, Universal Studios made The Mummy starring Boris Karloff (and then a bunch of sequels). Almost 30 years after that, Hammer Film Productions did a revival of The Mummy starring Peter Cushing and Christopher Lee (and then a bunch of sequels). This latter film was often shown in a double-feature with the vampire/Western film Curse of the Undead. In each of these films, the titular character is brought back to life by a magic scroll, and then dark deeds ensue. 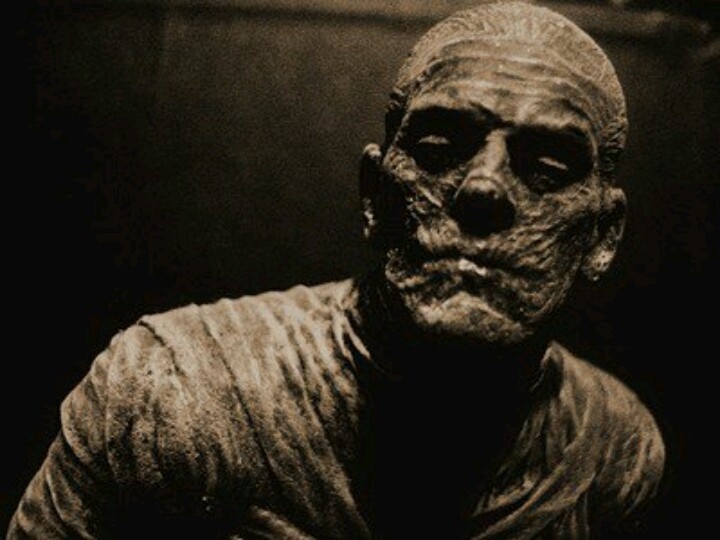 MUMMIES: Mummies do not drain life energy as Wights and Wraiths do, but instead their touch causes a rotting disease which makes wounds take ten times the usual time for healing. A Cleric can reduce this to only twice as long with a Cure Disease spell if administered within an hour. Only magic weaponry will hit Mummies, and all hits and bonuses are at one-half value against them. Note, however, that Mummies are vulnerable to fire, including the ordinary kind such as a torch. In OD&D Vol-2, Monsters & Treasure, Mummies have AC 3, MV 6, and HD 5+1; the above is the entirety of their explanatory text. Even with magic weapons you can only score half-damage on them. Now, let's look at the rotting disease. It appears that the only effect is to reduce healing rates. But this effect is inescapably permanent. Even if you treat it with a cure disease spell (and it must be within the hour! ), your healing rate is still half-normal, apparently forever -- failing that, the healing rate is ten times slower. That makes every combat you ever engage in for the future noticeably more dangerous. Ironically, OD&D doesn't actual set any "normal" rate for healing, so perhaps this really only affects magical curing, which is not called out explicitly; on the other hand, almost all future texts prohibit any magical healing whatsoever to subjects of the disease. Advanced Leprosy: The social disease afflicting all mummies, this is what causes wounds to take longer to heal. It is automatically contracted on contact with a mummy. If not cured within three days, there is a 95% chance of fatality, with a 2% decrease each successive day. Any character that succumbs to this dread disease may NOT be raised from the dead; they are permanently dead. So, apparently on top of the forever-reduced-healing from Vol-2, Arneson gives mummy rot a 95% chance of death per day, and only marginally decreasing over time. The overall chance of surviving such a regime is less than 10−18 (that is: if there was an entire galaxy of Earth populations, and all of them were infected with Advanced Leprosy, then only around 1,000 people would survive to the end). Plus anyone who dies is un-raiseable (perhaps somewhat analogous to those slain by energy draining rising as similar undead). There's an associated table that says for Advanced Leprosy, "% to Catch: 100%... Fatal %: 60% spec.". that 60% is a bit hard to parse... perhaps there's a 60% chance to die before one even gets to to 3-day mark? And it's also just slightly unclear how the magical curing works in conjunction with the core rule (Vol-1 says "within an hour", Sup-II says "within three days"). In any case, that seems like overkill upon overkill. Finally: Note that "social disease" is an old-school way of implying "sexually transmitted disease", which I'm not entirely sure what that is meant to imply here in Sup-II. Mummies are undead humans with existence on both the normal and the positive material planes... The scabrous touch of a mummy inflicts a rotting disease on any hit. The disease will be fatal in 1-6 months, and each month it progresses the diseased creature loses 2 points of charisma, permanently. It can be cured only by a magic spell, cure disease. The disease negates all cure wound spells. Infected creatures heal wounds at 10% of the normal rate. Mummies can be harmed only by magical weapons, and even those do only one-half normal damage... Magical fires are at +1 per die of damage... Any creature killed by a mummy rots and cannot be raised from death unless a cure disease and raise dead spell are used within 6 turns. In the 1977 AD&D Monster Manual, Gygax keeps the essence of mummy rot -- one-tenth normal healing; plus the negation of all curative magic (which will be in all editions from now on). And he at least borrows the overall intention of Arneson's supplement; the disease now also deadly, over a period of some months, with Charisma melting off in an apparently leprosy-like fashion. The resistance to even magical weapon blows is retained. He also adds a special fear ability, shown above. Hits have been increased by one die (to 6+3), just like all the undead except for the Ghoul. But in this case the disease can apparently be entirely removed by application of the clerical cure disease spell -- at any time, in some sense trivial for standard PC parties of a certain level. Unlike Arneson, a raise dead is possible, but with cure disease, it must be applied within 6 turns of death of anyone slain by a mummy (only slightly less harsh). Fire attacks are specified as advantageous (+1 per die). The 2E mummy is, for all practical concerns, a copy-paste of the 1E mummy. One thing stands out to me at the end of the combat block: the time frame to cure/raise victims of a mummy has been reduced from 6 turns to 6 rounds. Also, there is a new separate entry for a certain "Mummy, Greater", which runs about 5 pages in my digital copy. These mummies are ranked by age (less than 100 to more than 500 years), with hit dice from 8 to 13, AC from 2 down to -3, increasing rates of disease progression, and all with spellcasting powers of an evil priest from 16th to 20th level. This Greater Mummy is perhaps reflective of the overall inflation to monster abilities that occurred in 2E (esp. : dragons and giants), and perhaps borrowing something from Anne Rice's vampire novels which first appeared in 1976 and grew in popularity through the 80's. Despair (Su): At the mere sight of a mummy, the viewer must succeed at a Will save (DC 15) or be paralyzed with fear for 1d4 rounds. Whether or not the save is successful, that creature cannot be affected again by that mummy’s despair ability for one day. Resistant to Blows (Ex): Physical attacks deal only half damage to mummies. Apply this effect before damage reduction. Fire Vulnerability (Ex): A mummy takes double damage from fire attacks unless a save is allowed for half damage. A successful save halves the damage and a failure doubles it. In many ways 3E D&D "safety bumpered" PCs against the most harmful effects (for example: negative energy drains became temporary with a saving throw). Here, the mummy keeps its fear and resistance to attacks. But by wrapping the mummy rot in the standard 3E disease mechanic, it actually gets somewhat more dangerous; a victim can lose 1d6 Constitution every day, if a daily save is failed -- so likely dying in a few days instead of months as in 1E-2E. However: The original reduced-healing effect, for both natural and magical means, appears to be removed here (and it might as well be, being effectively negligible compared to the likely death from ability damage in a few days). And fire is made even more advantageous, doing double damage instead of just +1 per die. 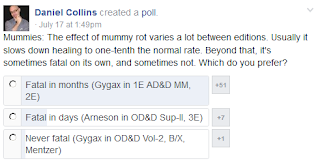 The "Greater Mummy" is not included, but a brief line in the stat block indicates "Advancement: 7-12 HD (Medium-size); 13-18 HD (Large)", broadly in line for the extra hit dice allowed in the 2E associated monster. Despair (Su): At the mere sight of a mummy, the viewer must succeed on a DC 16 Will save or be paralyzed with fear for 1d4 rounds. Whether or not the save is successful, that creature cannot be affected again by the same mummy’s despair ability for 24 hours. The save DC is Charisma-based. Mummy Rot (Su): Supernatural disease—slam, Fortitude DC 16, incubation period 1 minute; damage 1d6 Con and 1d6 Cha. The save DC is Charisma-based. I'm unaccustomed to the 3.5 edition making things more dangerous than 3E, but it does so here (well, a little bit). First, the mummy hit dice are increased from 6 to 8 (with the possible advanced types running from 9-24). The fear effect is about the same. But the mummy rot doubles up the 1d6 daily Constitution loss with a 1d6 Charisma loss (hearkening back to 1E/2E). Normal healing appears unaffected, but unlike 3E, magical healing (perhaps the type PCs are most interested in) may possibly fail if a caster check does. And the window for raising (6 turns in 1E; 6 rounds in 2E) appears to be entirely eliminated, with a dead victim apparently blowing away as sand instantaneously. Cure disease no longer has any effect on the victim of mummy rot, as it is now qualified as a curse instead; so something like remove curse is instead required. There is a certain charm to this, inasmuch as the pop-culture conceit is one of the "Pharaoh's curse" (see top), not the "Pharaoh's disease"; although this makes a cure somewhat easier to access, because remove curse is on both the cleric's and wizard's spell lists. Also: the half-damage from blows is gone, although it uses a "damage reduction" ability that shaves 5 points off any attack (so: even nonmagical attacks of sufficient strength can damage it, something not possible in any prior edition). Mummies are also members of the undead. They do not drain life levels, but their touch (if they make a hit) causes the dreaded rotting mummy disease which makes wounds take ten times the usual rate of healing. A cleric can reduce this healing time to only twice normal with a cure disease spell if it is administered within an hour. Only magic weapons can hit mummies, and they take only half damage from a hit. Note, however, that mummies are vulnerable to fire, including the ordinary kinds such as a torch, although it only does half-damage to them. When a mummy is first seen a saving throw vs. a spell must be made or the individual is paralyzed with fear and cannot move until the mummy strikes him or another member of the party. If the party numbers above 5 each member gains a +2 on his saving throw, as their numbers help dispel fear. Here's where we check in on the D&D Basic line, starting with Holmes in 1979. The primary project of Holmes was to closely duplicate the rules in OD&D with some of its supplements, with better organizational editing, and only rarely filling in a few gaps with extra rules; and this set the tone for most of the Basic D&D line(s) in the 80's and 90's. This is almost entirely true for this case of the mummy. Hit dice are the same as in OD&D (5); that is, without the inflation seen in AD&D (and this will remain fixed throughout Basic D&D). The half-damage from hits is the same. The rotting disease is old-school awful as in OD&D; a permanent healing reduction, not fully removable even with cure disease. As in Vol-2, it does not mention magical healing in any way. More importantly, it entirely ignores Arneson's escalation of the disease in Sup-II -- so that while distressing, it is not automatically fatal within a few days of catching it. It does not address or prohibit raising the dead victim in any way (not that raise dead is part of the Holmes level 1-3 basic ruleset). Now, Zenopus Archives tells us, looking at an early pre-publication manuscript, that "Holmes follows the description in OD&D closely, with no conceptual changes. The two paragraphs in the manuscript are retained in the published rulebook, which adds an entirely new third paragraph describing the fear induced by a mummy." I think it's been well established at this point that it was Gygax who took Holmes' manuscript and did an editorial pass on it, adding various rules to make it more aligned with his AD&D work. So in this case: The first two paragraphs are really from Holmes, encapsulating the OD&D mummy; and the third paragraph is Gygax, adding in the new fear power from AD&D. Gygax has a bit softer touch here, making the paralysis end as soon as any member of the PC's party is struck by the mummy (instead of a fixed 1-4 rounds). On the other hand, what Gygax missed in the second paragraph is that Holmes gave mummies only half-damage from fire, whereas in AD&D Gygax gives a bonus to fire damage, so in that respect the two game lines are now running in opposite directions. Mummies are undead who lurk near deserted ruins and tombs. On seeing a mummy, each character must save vs. paralysis or be paralyzed with fear until the mummy attacks someone or goes out of sight. In melee, a hit by a mummy does 1-12 points of damage and infects the creature hit with a hideous rotting disease. This disease prevents magical healing and makes all wounds take 10 times as long to heal. The disease lasts until it is magically cured. Mummies can only be damaged by spells, fire, or magic weapons, all of which will only do half damage. They are immune to sleep, charm, and hold spells. The text above is from Cook's Expert D&D (p. X36, 1980). Note that the disease now includes the prohibition on magical healing (not in the prior OD&D or Holmes; first seen in 1E AD&D); however, it is more generous in apparently allowing the magical cure to completely remove the ailment. It retains Holmes' half-damage from fire, in opposition to the AD&D line. Also following Holmes, it is silent on the issue of raising the dead (even that that spell is in this volume). It keeps the paralysis-fear, and ends it if either a PC is attacked, or the mummy moves out of sight; and Cook edits out Gygax's fiddly save modifier depending on number of people in the party. Mentzer's Red/Blue Box rules (1983) keeps almost the exact same rules text as in Cook. I can see only one change; the sentence about mummy fear does not end the paralysis on a PC being struck -- now, only if the mummy moves out of sight. Allston's Rules Cyclopedia (1991) mummy is word-for-word identical to Mentzer's, except for an added flavor-text paragraph. The half-damage from all blows is retained throughout all Basic editions. 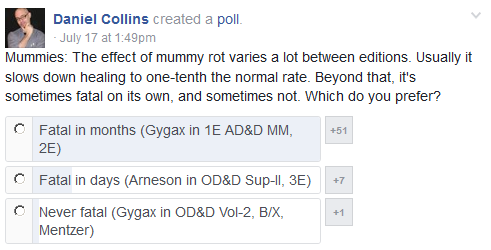 I asked about mummy rot on the Facebook 1st Edition AD&D group. In one of the more lopsided results that I've seen, almost everyone there did seem to prefer the 1E long-acting version of the disease. Looking at OD&D, we must admit that there are two separate, really incompatible takes on the mummy's curse of disease. Gygax in Vol-1 plans on the disease being a long-term degradation in recovery ability, over the course of months, perhaps. Arneson in Sup-II expects the disease to very quickly be fatal, within just a few days -- such that the slow-healing effect becomes a forgettable non-issue for practical purposes. Gygax's view held sway in 1E/2E AD&D and the Basic D&D line. But later editions from 3E on recast the disease as did Arneson, fatal in some days if not cured. Gygax's long-term disease is more in line with the classic pop-culture understanding of the Pharaoh's curse, in which tomb-intruders die horribly months or years later. But Arneson's quick-acting leprosy may possibly be more urgently, dramatically gameable. Which is your preference? When I’m developing a wilderness map, I always have to decide, “At what frequency should I place villages, cities, and castles here?” Below you'll find a short document that I've drafted on research for a model on medieval-level demographics. 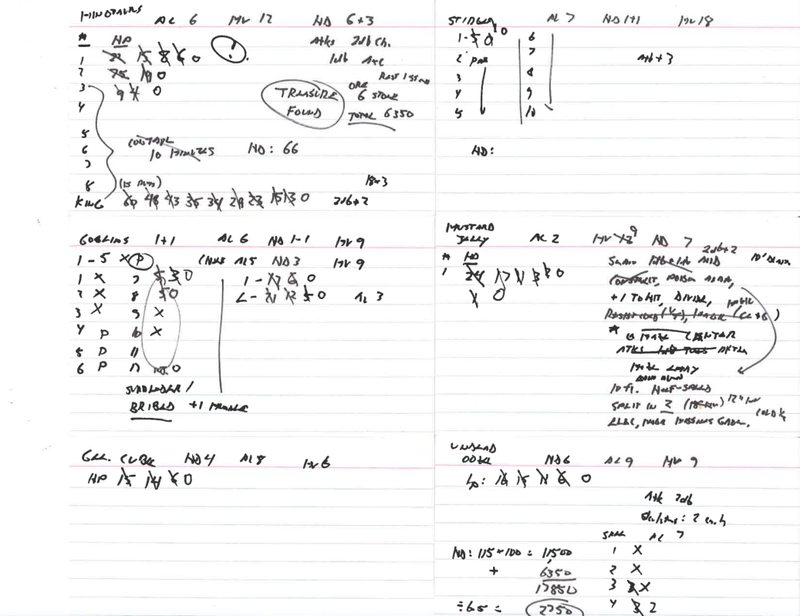 Of course, I'm not the only person to do this, and in fact I don't think this is the only time I've done this; but the document includes copious endnotes so I hopefully stop re-doing this and forgetting which parts are based on real-world data, and which parts I made up for the game. Cities: One per 1,000 square miles. Castles: One per 100 square miles. Villages: One per 10 square miles. Cities: One per 4,000 square miles. Castles: One per 400 square miles. Villages: One per 40 square miles. 100-mile hexes: Shows capital Cities (1 per 30 hexes). We can otherwise express this by stating that, on average, at Level 1 there is one walled town per hex; at Level 2 one castle per hex; and at Level 3 one or more villages per hex, and therefore these features are not shown on the maps at those scales. The 6-mile hex scale is expected for use in standard wilderness adventure and exploration (smaller sizes permit the entire map to be crossed in a single day, and are generally only used for introductory level adventures, or for added flavor, not strategic movement). We emphasize that at this exploratory level, it makes no sense to depict individual villages (historically, there would be multiple villages per hex); instead, we place castles as shown and assume that each of the adjacent hexes has between 1 and 3 villages in fief (within range of daily patrols, or for a runner/rider to get help within an hour or so). We further assume that the villages mostly have no amenities of interest to PCs (inns, taverns, general stores, etc.) In general we find this makes for attractive and gameable maps, with plenty of space left over for exploration and monster lairs. 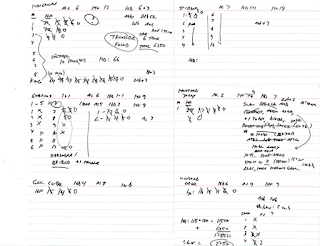 I was writing some stuff recently, and started wrestling with myself over how to present monster statistical notations in the adventure text. Partly this is a result of the formatting in classic TSR modules and texts varying over the years; but of course I want something that satisfies my own intuitions regarding brevity, usability, etc. 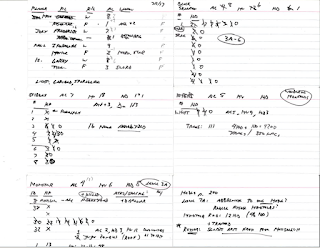 The primary difference in styles that caught my attention as I write this is that the earliest adventures included statistics in parenthetical notes within narrative text paragraphs (the contents of course varied, sometimes as minimal as just hit points, but that's a not my main thrust here). 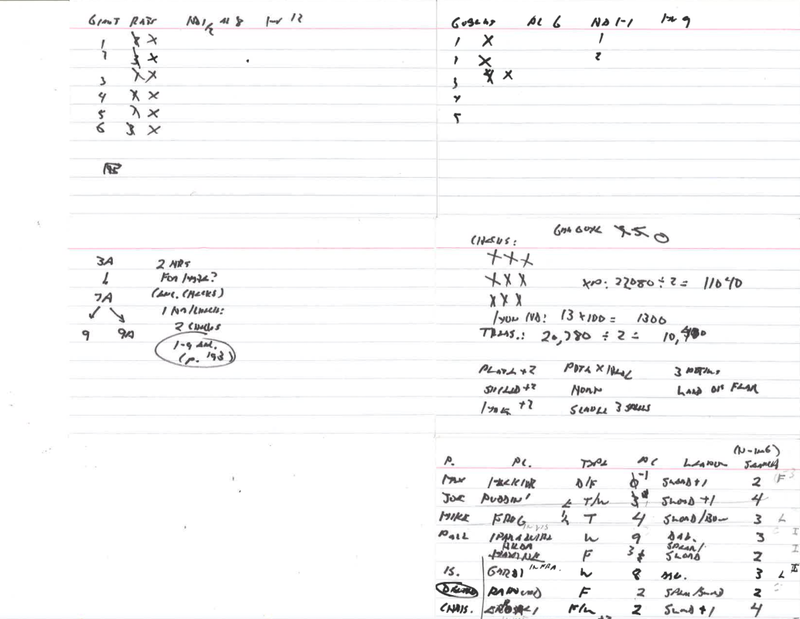 Adventures at a later date removed the statistics from inside narrative text, placing them instead outside of each paragraph, in a specialized statistical block. Prominent examples of the early style included the GDQ modules, AD&D rulebooks, B/X rules and B1-2, etc. ; examples of the later style would include module T1-4 and products of that era. So I started searching for where the switchover point was. Now, here's the discovery that made me think this worth posting about: Gygax's AD&D Dungeon Module S4, The Lost Caverns of Tsojcanth, published in 1982, surprisingly constitutes the exact switchover point all by itself, because it actually includes both styles within the one product! Namely: The original dungeon-based adventure area, the "Lost Caverns" (used in Winter Con V, 1976), maintains the older parenthetical in-paragraph style. But the newly added wilderness encounter areas (which actually appear first in the module) instead use the newer isolated-stat-block style. The 1982-1983 era was clearly a time of great flux in the presentation of D&D rules and adventures. You'll notice in the S4 wilderness example above that the "new style" isolated stat blocks were given before the text, whereas later it would usually be after (a minor modification, I think). The Hickmans' modules I3-5 in 1983 had a very regimented structure of every single paragraph being labelled for either "Play", "Monster", "Treasure", "Character", etc. By 1985, T1-4 kept only the smallest part of that, with a specialized paragraph labelled "Treasure" for each encounter area. While I'm not very fond of those experiments at hard regimentation (or even "boxed text" descriptions), on reflection I really do like the statistical elements being removed from the text paragraphs, and it's probably the only new formatting idea from that time that was "sticky" and still commonly used today (e.g. : see Bill Webb's Rappan Athuk). Among the advantages are: allowing the writer to stay in the descriptive "voice" and not get distracted by statistical elements (perhaps more of a problem for some of us than others); easier for the DM to read and parse sensory descriptions in play; better for finalizing paragraphs/orphans separate from stat edits; more attractive on the page; and, if desired, easier to convert a product to other game editions. 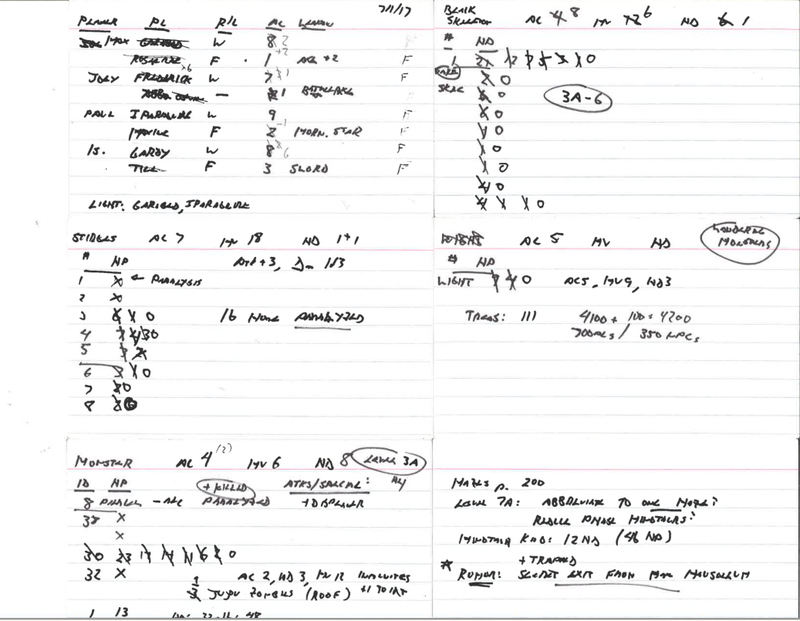 Took out all of the formulas on the 1st sheet and replaced them with fixed values; and clarified column N with the label "Table" (it's meant to indicate the recommend Wandering Monster Level Table). 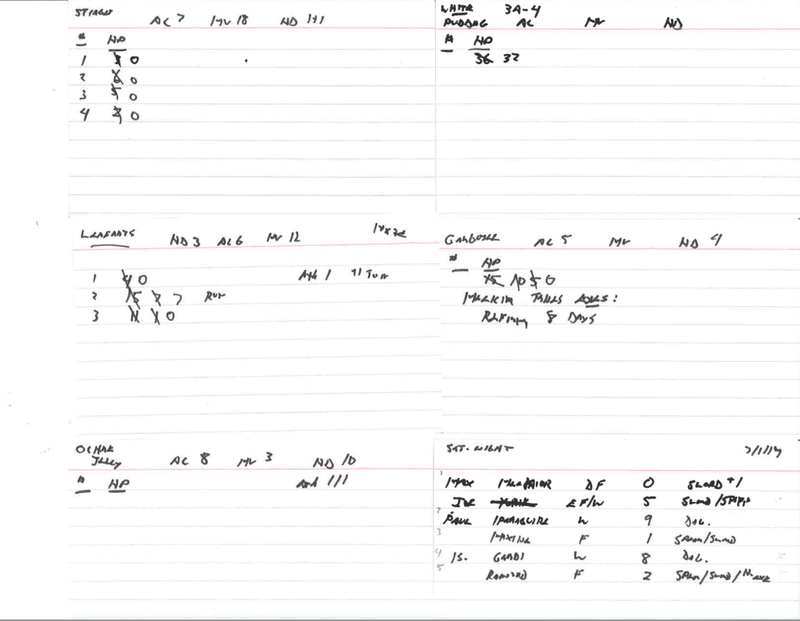 On the 2nd sheet of stat blocks, converted the CONCAT function to the more traditional CONCATENATE. Added a 3rd sheet explication of the conversion in use of EHD to Monster Table (for use with VLOOKUP in any future additions). While I personally created this in LibreOffice Calc 5, this version was tested and found to work in both Microsoft Excel 2010 and 2013 (in the former, after a file validation and repair operation), including the computed stat blocks on the 2nd sheet. Tell me if you still have notable problems with this version! This module was originally used for the Official Advanced Dungeon & Dragons tournament at Origins '79. This special numbered collectors edition (300 copies in print) contains background information, referee's notes, a large four-level map and reference matrices. Pre-rolled characters are included with brief histories for each. 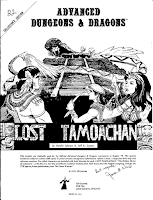 LOST TAMOACHAN: "The Hidden Shrine of Lubaantum", is the first in a new line of Collector's Edition modules from TSR. If you find this module intriguing, look for the TSR logo on future publications from The Game Wizards! There are many differences between this edition and the later, more mass-market publication of module C1 in 1980/81. For starters: The formatting is much more rudimentary; just run directly off a personal typewriter in a single mono font, from what I can tell. Areas are identified variously by letters or numbers (names of areas generally match C1, but the numbers do not). There is no separate illustration booklet, and generally just a few illustrations in the module itself. There is no tournament scoring system (which makes me suspect that the system in the later C2 was made just for that publication, and not used at Origins). As an aside: If you're curious, the only other "Collector's Edition" item was module C2. Anyway, here are the tidbits that I find the most interesting. Now, this tactical scene, with all distances given in inches, and the 1" = 5 feet scale is particularly interesting because it's written within the same year (1979) that Gygax is writing in the AD&D DMG, "Each ground scale inch can then be used to equal 3⅓ linear feet" (p. 10). On the one hand, when ranges are specified in OD&D/AD&D, they are given in 1" units where officially 1" = 10' indoors, 30' outdoors, but (awkwardly) this should be a separate and distinct consideration (i.e., units-of-account only, not reflecting actual tabletop usage). But when the later module C1 was prepared, this pelota scene (now area #29) was edited to read, "The ball moves in increments of 5' (½")", and all the other references were converted to feet instead of inches, as though the editor wanted to mostly avoid the whole tactical issue (i.e., movement from a PC hit was no longer damage-as-inches, but instead a fixed "15' per blow"). Is this the earliest reference in an official D&D product to use of the 1" = 5 feet tactical scale? If we were wildly conspiracy-minded, we might be tempted to allege something outrageous, like that it took an ongoing and concerted cover-up to avoid the rather blatant fact that original D&D scale should have just been 1" = 5 feet all along, the most playable and mathematically direct conversion when playing with 25mm man-to-man figures. 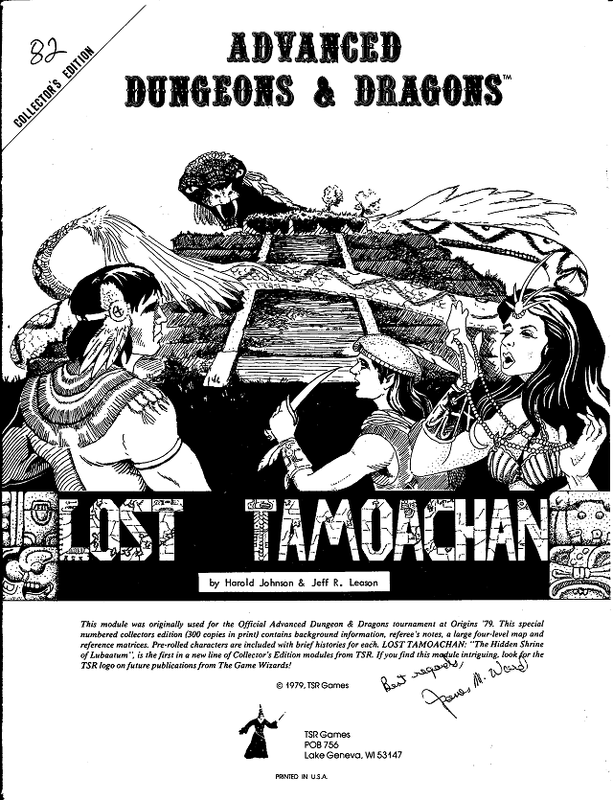 Most of the treasure in Lost Tamoachan is valued in units of silver pieces -- not gold, as is customary in official D&D. It seems like most of the treasure in areas #1-11 is valued in gold pieces, while the treasure in areas #12-25 is generally priced in silver pieces (there are exceptions to this assessment). Is it possible the Johnson/Leason originally played their games with a (more historically realistic) silver-standard economy, and partly but incompletely managed to convert that for their Origins tournament module? 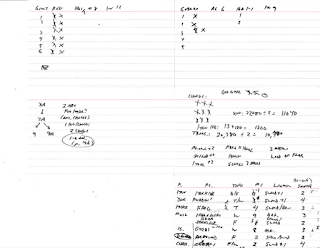 When the later C1 module was prepared, all of these silver treasure valuations were converted by the rules-as-written in AD&D, in that 1 gp = 20 sp should be the base economic unit; that is, all of the silver treasure valuations were divided by 20 or thereabouts. Note that standard jewelry treasure in any version of D&D is valued in units of hundreds (ostensibly gold pieces). The original adventure text has treasure on this same order-of-magnitude; but the converted module C1, with jewelry valuation through in the single-digits and teens (as seen above), is an anomaly. The physically biggest treasure caches become effectively worthless garbage in the AD&D economy and XP system. The only thing that makes sense is that someone was originally running their economy and XP awards in silver-standard units. Again, this echoes the prior section: there is an "obviously correct" scale to D&D pricing values, and it's not really in gold piece units. It took a lot of labor over time to try and continually align the publications with Gygax's early and fundamental errors. This is somewhat further confused by the fact that, despite the amount of adventure text dedicated to treasure descriptions (the passage quoted above is just the start of a 10-paragraph presentation of treasure in one room! ), treasure is not a factor in the C1 tournament scoring system. Perhaps the most obvious deduction, granted that the the original Lost Tamoachan had no such system included, is that originally the tournament was judged simply on value of treasure taken, and silver units were initially the basis on which that was scored. 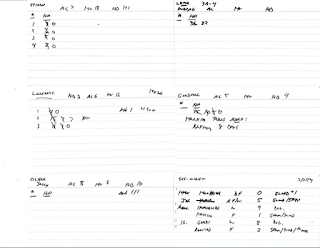 Languages -- The pre-generated characters in Lost Tamoachan are given extensive language lists, and these are important at many points of the adventure. Included among them are Latin, Hebrew, "Tolemy (astronomer's script)", "Harney (Hillfolk tongue)", and "Melange (merchant business tongue)". In the later publication these seem to be respectively replaced by the World of Greyhawk setting elements of Suloise, Elven, Old Oeridian, Orcish, and Flan. The Mouther -- Lost Tamoachan features (in area #21) the first appearance of the infamous gibbering mouther monster, before it actually was assigned that name. Here, it is simply called the "Mother" throughout -- "'Mother' was once worshipped as the goddess of the earth...". When turned into a more generic monster in C1 (and Monster Manual II), the "mother" became the "mouther". Hopefully you all are using 1" = 5 feet scaling and silver-standard currency at this point. And salutations to you for being so sagacious and tasteful.